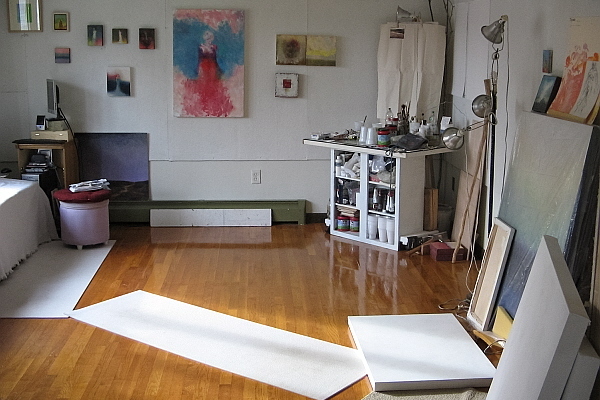 I have recently moved to Biddeford, near Biddeford Pool, where my new home studio is. After many years of painting in tiny, crowded spaces, we knocked out the wall of what had been an innocuous living room to make way for the type of living that I do: Painting. I can extend my wingspan here. It is a quiet space between my favorite beaches to build new surfaces, risks, and dreams into being. Dog benches, brushes, tools, and yoga mats all stay spare and low to invite bold color into the new light. It is a deep breath amid the sounds of knives and brushes mixing color. Life’s second wind. With a practice based mainly in installation work, I have a number of workspaces that serve as a studio. This photo is of my barn, which is attached to my house and serves as a workshop where I fabricate my installations and objects. Scattered around are disassembled pieces from previous projects, waiting to be used again. On the second floor, I store completed pieces away from the activity of the workspace. Oftentimes, my kitchen also becomes my studio, where I develop and design, my dinning room becomes my construction area when it is too cold to be in the barn, and the gallery is where the work all comes together in form. 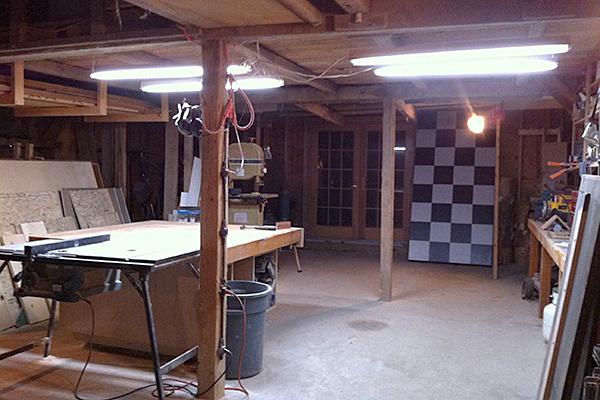 My barn is where I feel most creative, however, surrounded by the remnants of my work.